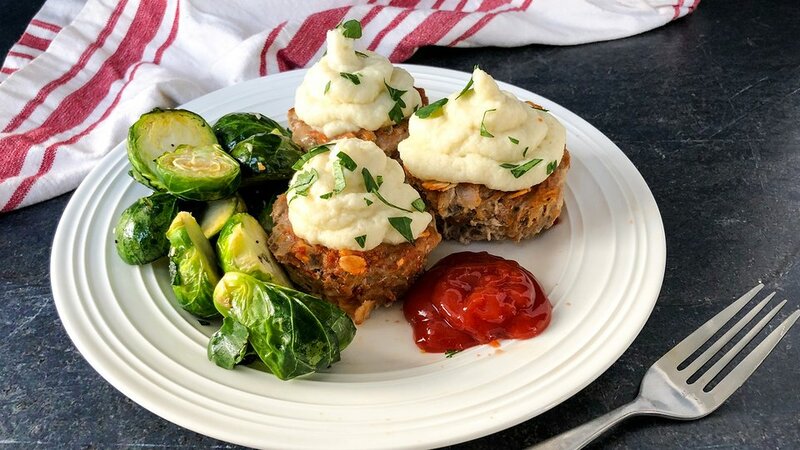 These savory turkey meatloaf muffins are not only easy to make, they're also low in calories and carbs! They make a flavorful, fuss-free meal prep option the whole family will gobble up. Combine muffin ingredients using a fork or your hands just until ingredients are evenly distributed. Lightly coat a nonstick muffin pan with cooking spray, then add 1/4 cup of turkey mixture per tin, using the back of the measuring cup to press down into the well. Bake muffins for 25-30 minutes, or until internal temp reads 160 degrees F.
Meanwhile, add steamed cauliflower, parmesan, buttery spread, garlic powder, and salt (if using) to a blender. Blend briefly, then scrape mixture down the sides and blend again until smooth and creamy. Allow muffins to cool for 5-10 minutes, then spoon cauliflower mash into a sealed baggie. Cut off one corner and pipe mixture onto muffins like frosting. Enjoy hot with a side of steamed veggies, or divide between meal prep containers to enjoy the rest of the week! Will keep in the fridge up to one week; freezing not recommended.